Here are some preliminary notes on choosing fruit trees that crop regularly and produce fruit of good flavour. There are no apple varieties which can tick all the boxes. Knowledge of the weather patterns in the various areas of the UK is therefore essential, in order to plant the right varieties. 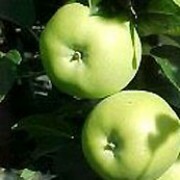 However there are varieties which I would give a treble A rating, when it comes to making up trios of apple varieties. Groups of three varieties are best as several varieties need good cross pollination. Without this, even excellent varieties will still perform. The ones I am going to single out all have fruits of excellent eating or cooking qualities. Secondly these varieties also excel in producing fruits of long keeping qualities. However the right combination of these varieties needs to be made, according to the site and soil available in the different counties. Having said all this, I would put the following varieties at the top of my list. Anyone considering planting some apples should include at least two of these varieties, suitable to the area where you live.